Siemens recently introduced the Gigaset S685 IP, a nice compliment to its rapidly growing lineup of hybrid handsets for IP telephony. Not only is this cordless phone packed with great features, it also provides superior sound quality with the aid of HDSP (High Definition Sound Performance). This technology produces the human voice in a more natural tone, making it sound is if the person on the other end is right beside you. Equipped with an easy to use Bluetooth interface, the Gigaset S685 IP can be connected with any commercial brand of Bluetooth headsets. This compatibility enables syncing with a range of devices including mobile phones, PDAs and even PCs. By downloading the free QuickSync from the Gigaset website, you can transfer contacts from the Outlook email client or photos to use for the caller ID function. While the Gigaset S685 IP connects seamlessly to a computer, it doesn’t need one to perform. 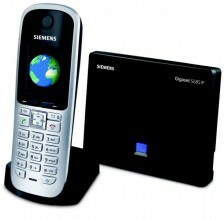 Its hybrid nature enables calls over a fixed network or the internet with VoIP. You can easily switch between network connections with the simple push of a button. The multi-line function allows you to create up to six IP accounts. The Gigaset S685 IP also supports multiple users, allowing simultaneous calls to be made over two IP lines and a single analog line. After using the handset for the first time, you are automatically registered with free services from Gigaset.net, granting access to network communications via phone or online chat. Boasting a 128 x 160 pixel multi-colour display, the Gigaset S685 IP offers brilliant images that rival some of the best digital cameras. This is really highlighted when personalizing your phone with an array of wallpaper designs. Taking its network capability one step further, the Gigaset S685 IP can subscribe to your favorite RSS feeds on the web and also access millions of phone numbers throughout the world. This is all made possible by Siemens’ partnerships with carriers in countries such as Germany, the Netherlands, Denmark and Norway. 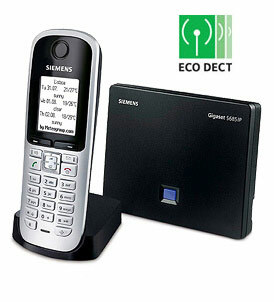 Cutting-edge technology in ECO DECT makes the Gigaset S685 IP very environmentally sound. The integration of switched-mode power sources reduces energy consumption up to 60% when compared to other headsets. Switch the headset into ECO mode and transmission power is trimmed by up to 80%. When resting in the base station, transmission power is reduced almost entirely. All Gigaset cordless phones are designed with convenience in mind and the S685 IP is no different. The hands-free function makes for easy communications while the built-in answering machine allows you to keep up with important messages. With the ability to store up 30 minutes in recorded messages and remote access, this phenomenal hybrid assures that you’ll never miss another call. This entry was posted in General and tagged cordless phone, gigaset, siemens, Siemens bluetooth, VOIP phone, Siemens Gigaset, ECO DECT, gigaset S685ip on 15/09/2008 by Craig.